This morning I woke up to the news that Alan Rickman had passed away. Now, fourteen days into 2016 and the world has been hit by one celebrity death after another. Everyone is affected differently and everyone is hit differently. This one hit me hard. 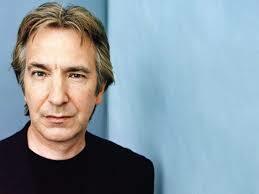 Alan Rickman was a major part of my childhood. He was Professor Snape. He is Professor Snape. He brought to life this character we hated and loved and loved to hate and hated to love. He delivered some of the most iconic lines in Harry Potter and delivered them in a way (and at a pace) that we will never forget. Alan Rickman was a brilliant actor in everything he did. My heart goes out to his friends, his family, and his fans who are feeling this loss today. Thank you Alan Rickman, for all the work you did over the years and for giving us the best Professor Snape there ever could have been. You will be remembered. Always.